Like Portland, pacificwild catering prizes the region’s rich palette of flavors. 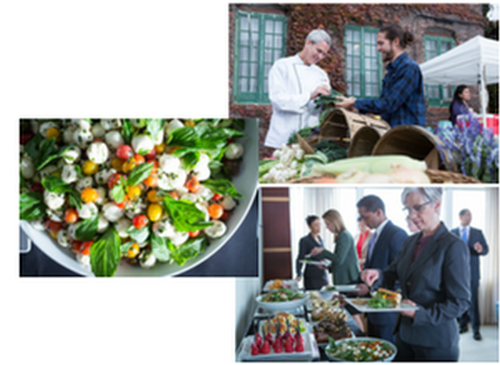 Our passion for seasonal ingredients and sustainability transforms Portland Expo Center events into more than a pleasant experience accompanied by a good meal. Promoting Oregon’s culinary and cultural heritage is a mission, an expression of our commitment to the state’s abundant resources. It also allows us to transform every occasion – whether it features 10 guests or a thousand – into a celebration of place and spirit. That means pacificwild catering’s menus are always fresh and seasonal, influenced by the region's bounty. We believe we've landed on the perfect, delicious balance of sophistication and approachability by simply spotlighting the quality of our locally grown ingredients. Let us create your next unforgettable culinary experience by cooking straight from the source and in a way that puts the culture, flavors and passion of the Pacific Northwest into your next event.